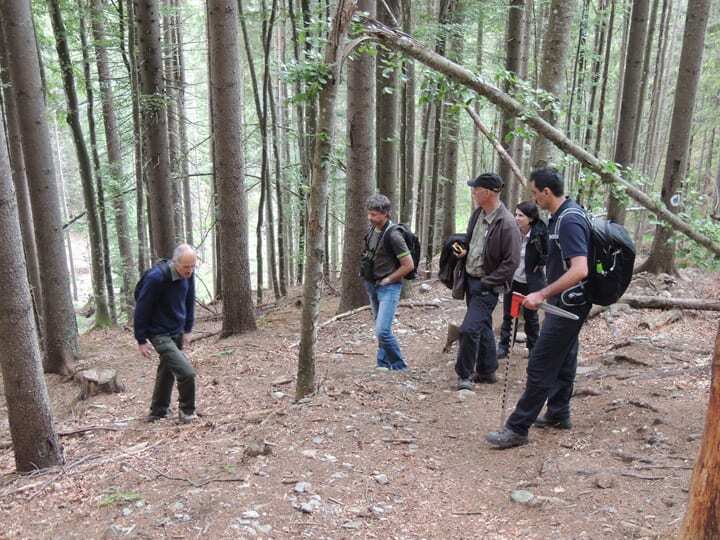 On July 4th, we took Prof. Tudoran from the Faculty of Silviculture and Forest Engineering of “Transilvania” University, Brasov, on a field trip to the spruce forests of the upper Lerești Valley. Purpose of the trip was to develop the best methodology how to convert artificial spruce forests back into natural forests. The methodology will consist of assisting broadleaved tree species (beech, sycamore, alder, elm) by extracting spruce trees, or of cutting pockets into the spruce thickets to allow light into the dense cover and to create space for natural regeneration or future planting of saplings from FCC nurseries. We will first work in test plots in order to set or adjust the average volume to be cut per hectare, and then apply the right percentage of extraction on 400 ha of unnatural spruce forests.